Yamaha RX-S600 review | What Hi-Fi? It is a common misconception that hi-fi and AV enthusiasts have a thing for massive boxes. How an amp works is what really matters, and it just happens that the best of these usually come in a package the size of a baby elephant. Not everybody has the space (or permission from their loved ones) to take one of these home. Thankfully, it is possible to have a smaller box without a huge compromise on sound and handy features – as this Yamaha RX-S600 proves. This is a slim AV receiver. And by ‘slim’, we mean ‘less massive than usual’. At 11cm high and 32cm deep, it’s still a hefty machine – only now it’s much easier to fit onto a rack with your other kit. But just because it’s a smaller amp, that doesn’t mean you will be picking up a lesser amp – at least when it comes to build and design. The good folks at Yamaha haven’t just hacked bits off to save space: they’ve moved things about and – in some cases – included custom-designed parts, such as the transformer and heat sink. The build is up to the strong standards we’ve come to expect from Yamaha. The moment you lift this amp out of the box you are impressed with the quality – no corners have been cut. Buttons are solid and dials are smooth, turning with just the right amount of resistance. And despite weighing 2.2kg less than the full-bodied Yamaha RX-V675, the S600 never feels flimsy. Naturally, a smaller amp has less space for connections. Nonetheless, the S600 packs a respectable number of sockets. You get speaker and subwoofer outputs for a 5.1 surround sound set-up. There are five HDMI inputs, all of which handle 4K and 3D pass-through. One of these supports MHL (for HD content from compatible smartphones and tablets), although we wish this was at the front of the machine. Digital audio inputs come in optical and coaxial forms (two each), and there’s a handful of analogue RCA sockets. There’s also an FM/AM terminal. 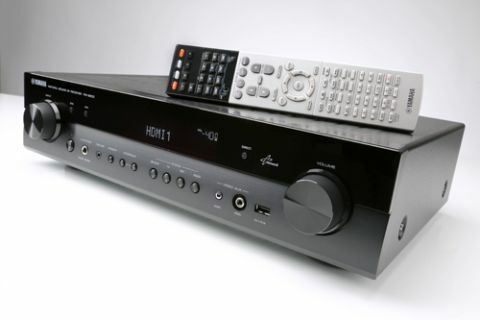 There’s a DAB version of this receiver – the S600D, yours for an extra £50. There’s no built-in wi-fi or Bluetooth – you’ll need to buy adaptors for that – but there is an ethernet socket for wired internet. Network-based features include AirPlay, internet radio and Spotify Connect. There’s also DLNA, which lets you stream content from a networked computer. Or you can plug in a USB stick and play files that way. You can play files in MP3, AAC and WMA, as well as FLAC and WAV files up to 24-bit/192kHz – welcome news with the recent push for high-res audio. Setting up the amp is very easy. Connect the bundled microphone to the dedicated input on the front panel and automatic set-up begins. After pressing ‘yes’ a couple of times, you’ll get about 30 seconds of test tones, which the amp uses to calculate the sizes, distance and volume of your speakers. And that’s your work done. The measurements are fairly accurate, although we’d always recommend checking the small/large speaker setting is correct. The system interface is easy enough to navigate, but it is very basic. We could do with something a bit slicker and more colourful, although at least you’re never at risk of getting lost. Controlling the system is a mixed experience. There’s a nice-looking, fully loaded remote control, but the labelling is tiny and the bottom half is too densely packed with buttons. There’s no backlighting either, so you’ll likely press the wrong button if you’re sitting in the dark. Thankfully, there’s an alternative in the form of the free AV Controller App, available on iOS and Android devices. It’s colourful, easy to use and has a more comprehensive set of options than the regular offering. In this regard, while Yamaha has shed the pounds, it has maintained its audio quality. It’s not the very best performance at this price, but you get a proper 5.1-channel home cinema sound that is satisfying, entertaining and never lacking. We start testing with a Blu-ray of The Hobbit: The Desolation of Smaug and it’s an expressive, full-bodied sound. Dialogue is weighty but clear and nicely defined. Explosive moments (any time the dragon Smaug breathes fire, for example) are meaty and dynamic enough to pack a really proper punch in sound. It’s a coherent performance that demonstrates excellent control. Chaotic scenes (again, any time Smaug breathes fire!) never sound cramped or crowded, and the surround effects direction has a good degree of precision. There’s also an impressive amount of detail. Crumbling rocks and weapons clashing are given plenty of texture, and the effects are convincing. It’s a strong overall performance, although in absolute terms the Yamaha doesn’t quite reach the standards set by the Award-winning Sony STR-DN1040. The Sony edges ahead with better dynamics, subtlety, precision and scale – as well as 7.2 channels for a richer experience. But then again, we’d expect superior sound and features from a full-sized home cinema amp. Considering this Yamaha’s stripped-down approach to design, its performance is highly commendable. Overall, the Yamaha RX-S600 slimline AV receiver is a success. Sure, it doesn’t match the very best for sound and features. If you have the space and want the very best sound, you should purchase a full-sized amp. But what this Yamaha offers is not a watered-down experience. On its own terms, the amp offers very competent home cinema sound. And if your house is already a bit cramped with equipment, this Yamaha will give you some breathing space.